Gel knee pads can be a tremendous help if you are suffering from knee pain, have injured your knee or recently had knee surgery. They are great if you are having pain kneeling down and can be used to provide padding and protection to the knee joint from impact injuries. Protecting your knees with these pads can reduce your pain, speed up healing and enable you to keep doing the activities you love. Gel knee pads are a must for anyone who spends time on their knees whether it's gardening, housework or manual labour, such as roofing and carpet laying. They are particularly useful for conditions such as Osgood Schlatters, Arthritis, Housemaids Knee, Chondromalacia Patella and anterior knee pain as they provide a soft cushioned surface to kneel on and reduce the pressure through the knee. Knee pads also help spread out the force going through the knee, rather than it all going through one point. There are loads of different gel filled knee pads out there, made of different materials, with different brands available in different countries. Here I share with you my favourite ones from the US & Canada and the UK. My verdict: Great mid-range option. These work well either over clothes or against skin. They stay in place well and are extremely comfy - people forget they have them on. Overview: These gel filled knee pads reduce harmful, painful pressure on the front of the knee and redistribute body weight evenly. They are extremely comfortable, even when worn all day. Their long cap design optimises comfort and stability. The upper and lower elastic sleeves ensure the pad stays in place and there is an extra elastic strap with a hook and loop closure towards the bottom of the pad. My verdict: Top of the range, suitable for garden work, construction, roofing etc. These are extremely comfortable gel knee pads – one person stated they felt like kneeling on soft clouds or pillows! Comes in pairs. 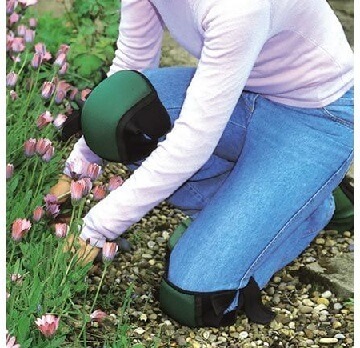 Overview: These knee pads are perfect for wearing around the house and garden. Comfortable to wear, lightweight yet durable design and an easy to use adjustment strap. Sold as a pair. My verdict: Great budget option. Comfy, easy to move around in, and provide good cushioning. My verdict: For jobs when you are constantly kneeling for long periods, these are the bee's knees. People with small legs tend to find they slip down when walking though. Overview: These gel knee pads are designed to put maximum protection where it is needed most. The built-in flexibility provides long-lasting comfort and the embedded I-Gel insert provides maximum impact resistance. The non-marking cap will not damage surfaces. They are made of non-slip material to avoid sliding around on hard surfaces. Breathable perforated neoprene straps. My verdict: These are my favourite if you are likely to be up and down a lot, as they stay in place well due to having two straps, even when you are walking around. Really comfortable and can be worn all day. They are the largest of the three – best to wear over your trousers. Overview: Pair of knee pads that contain a gel foam core for maximum comfort. They also have plastic cups for extra protection. They come with elasticated straps with Velcro fastenings to ensure a perfect fit. They are comfortable and easy to wear, and are designed for prolonged use. My verdict: Great budget option. Comfortable even when worn all day. Gel knee pads are a great way to reduce pain when kneeling. If you are also having problems with pain and weakness in the knee when doing activities, have a look at the brace guide. Or if you are wanting help working out what is causing your pain, go to the Diagnose your Pain section.